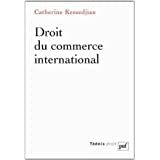 Catherine Kessedjian, who is professor of law at Paris II University and a former Deputy Secretary General to the Hague Conference, has published a new treatise on French International Commercial Law. As is traditional in France, the book includes developments on international commercial contracts, but also on the law governing corporations (including international insolvency) and international dispute resolution. A table of contents and more details are available here.